So easy you’ll never need to use store-bought marinara again! OK – I know I posted an Easy Marinara Sauce recipe before, but given that it involved chopping half a dozen different veggies, I feel like I may have been exaggerating the “easy” part just a little. Don’t get me wrong – it’s super delicious and healthy, it’s just not as simple as it gets. 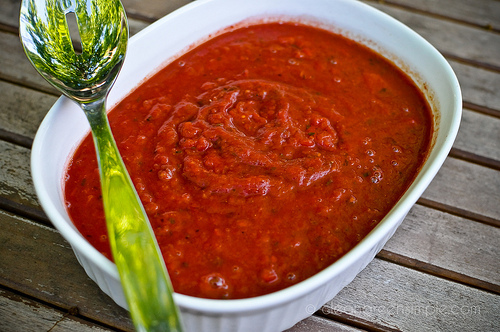 This vegan marinara, on the other hand – not sure how it could get easier. I guess, technically, buying a commercial brand of pasta sauce is easier, but not by much, and this is way healthier and more delicious. Just open up a big can of crushed tomatoes and a can of diced tomatoes (technically you don’t even need the diced tomatoes, but I like a little chunkiness to my marinara sauce). Dump them in a pot. Add a few dried spices (I’m not even making you chop garlic! But if you have a hankering to chop something by all means use fresh) and you’re good to go! I don’t even have any progress photos because there’s pretty much no progress aside from opening a can or two and twisting the lids off some spices. My one suggestion is to start this sauce when you start the water boiling for the noodles – if it gets at least a good 20-30 minutes of simmering time it’s very happy. 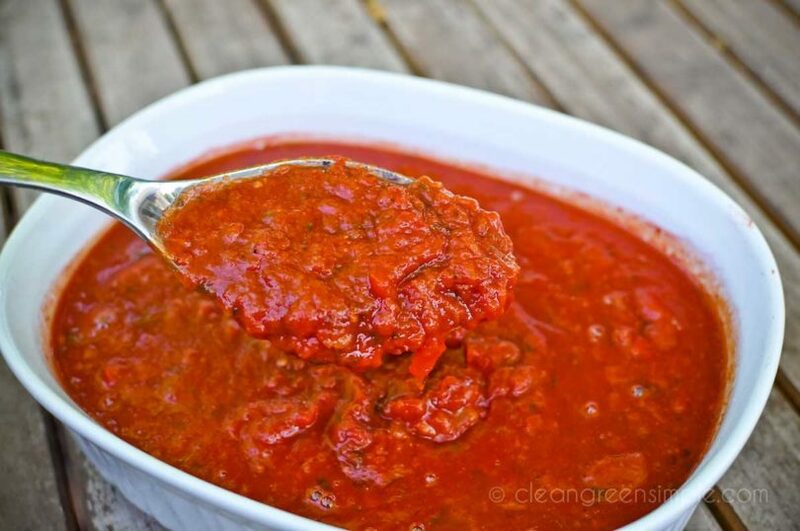 I know there’s a million recipes for marinara sauce on the internet, but I wanted to add my contribution – I think it’s pretty delicious! Plus, I’m going to be giving you a recipe for a crazy good Eggplant Parmesan next week and I figured it would be nice to link to a homemade marinara sauce to go with it. Combine all ingredients in a saucepan and heat over medium heat until boiling, then reduce heat and simmer for at least 20 minutes, up to an hour. Tried this recipe?Mention @CleanGreenSimple or tag #CleanGreenSimple! 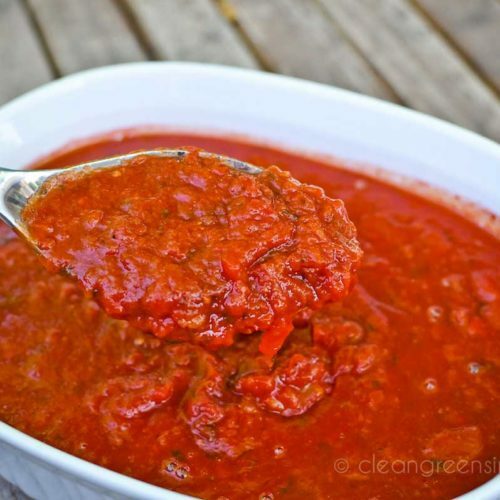 This looks like my go to marinara recipe! Until I get carried away and end up chopping up a gazillion veggies to throw in there! I do this every week, except with fresh tomatoes, which are marked down at our local produce shop ($0.99 gets you 5-6 vine tomatoes; score!). with a bit of knife work, some time in the slow cooker, and then finishing up on the stove top, I have fresh marinara sauce for the week. One of the best sauces on earth. The longer it simmers, the better the taste, but the whole cooking time is really worth the effort. lovin” all of the ingredients in this perfect Italian classic recipe! 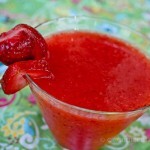 I’ll have to make this when my tomatoes are ripe! Thanks! How many fresh tomatoes would replace the canned? i love this recipe! i make it with a health cheese sandwich. it is a delectable quick and easy dish! 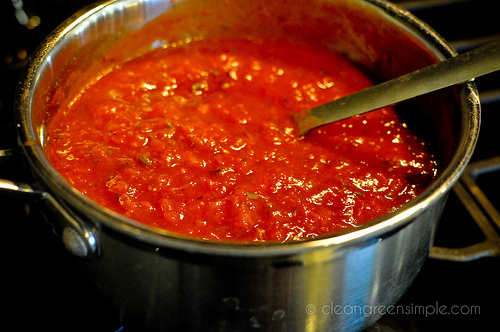 This sauce it’s amazing, I have it bookmarked because I’ve made it so many times now. I do use fresh garlic and onion. I cook very healthy all the time, it’s great not having to buy supermarket sauce but being so easy atthe same time. I’m trying to cut salt and sugar and oil from my diet, in addition to going vegan, so I nixed even Ragu Traditional. I tried Muir Glen canned sauce but the flavor wasn’t right and was disliked by our whole household. I’ll be trying this and omitting salt. Great recipe. 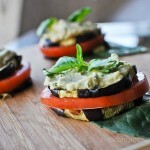 – I added a liittle extra garlic (I love garlic) and 2 tsp sugar, then I poured it over grilled eggplant. Yum, that looks great. I was just wondering, how long does it stay refrigirated without turning bad and does it freeze well? Melissa: 2 cups, for the diced & 3.5 cups for the crushed. The poundage, or # of tomatoes varies, according to what type of fresh tomatoes you are using, such as more Roma tomatoes would be needed than 2 large 1 pound tomatoes. If you are buying fresh tomatoes, by the pound, (16oz.) then, you’d need at least 3 one pound tomatoes. 16 oz. (1# fresh tomato) x 3 = 48 oz. 28 oz (can)+ 15 oz. (can) = 43 oz. total. So that’s about a half cup difference, between canned, and fresh. I don’t think that half a cup will make that much difference, when the sauce is cooked down. One might need to add some tomato paste, if the sauce is too runny.